The first leg of our 12-day itinerary to the Philippines was in Tagaytay, a popular destination in the Southern Tagalog region specially during summer due to its cooler climate and stunning scenery. I live in a town (now a city) which is very close to this city and we normally spend half a day here to enjoy the friendlier weather and have a meal at one of its numerous restaurants. 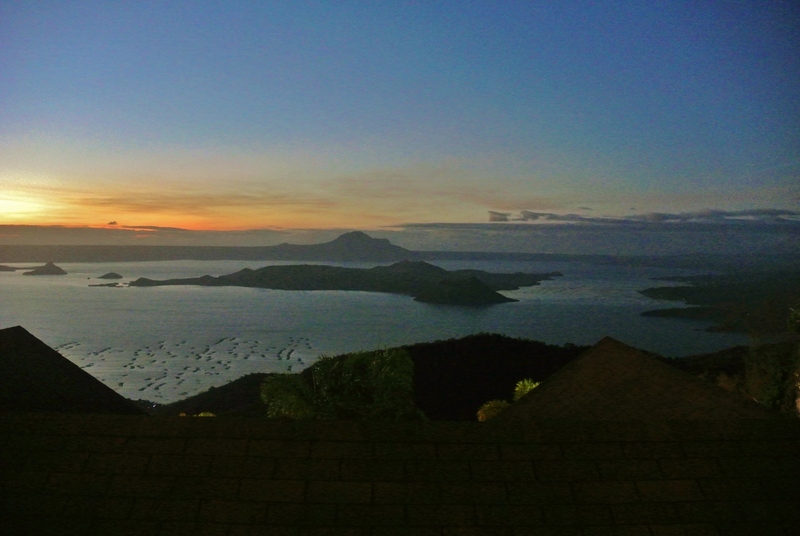 The famous Taal Volcano which can be seen from Tagaytay. To be very honest though, we wouldn’t have included a 5-day stay in Tagaytay if it wasn’t for the wedding that we were going to attend in this city. It was only during this holiday did I realize that a 5-day stay here is actually quite enjoyable too. Specially if you love to eat as I think it has become the gastronomy capital of the south with the myriad of unique restaurants around the area. March is considered a peak season in the Philippines and the hotel prices were ridiculous at the time. Eventhough we were there during the first week of March, we couldn’t escape the steep prices charged by hotels. I’m a big fan of family-run hotels and I prefer spending my travel money to these small hotels rather than the bigger ones. Tagaytay has a lot to offer when it comes to one of those mom and pop’s hotels and one of them is the very cute and charming Joaquin’s Bed and Breakfast. If you’re following me on Instagram or Facebook, you’d know how much I have enjoyed my stay in this property as I couldn’t help myself from posting all of the gorgeous photos I have taken from Joaquin’s Bed and Breakfast. The view from the breakfast area. How can you not fall in love with it? The location of the property is perfect! It’s very near to almost every places you need to be in Tagaytay, of course most of those are restaurants. It’s also very near to the church where we’ll be attending a wedding and the clubhouse where the wedding reception will be held so it really was good for us. 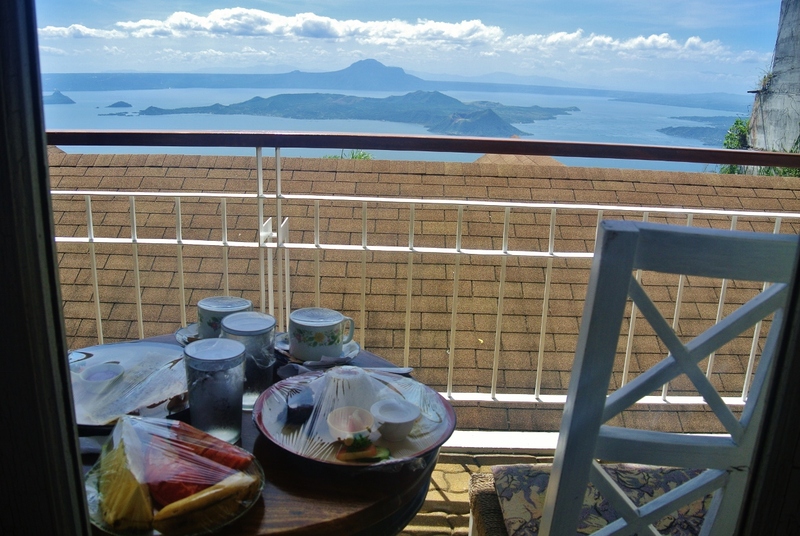 Our room was quaint and cozy with a veranda which offers an incredible view of Taal Volcano in the middle of Taal Lake. I have suffered from a jetlag during my first few days and I usually wake up at around 2 or 3 in the morning. 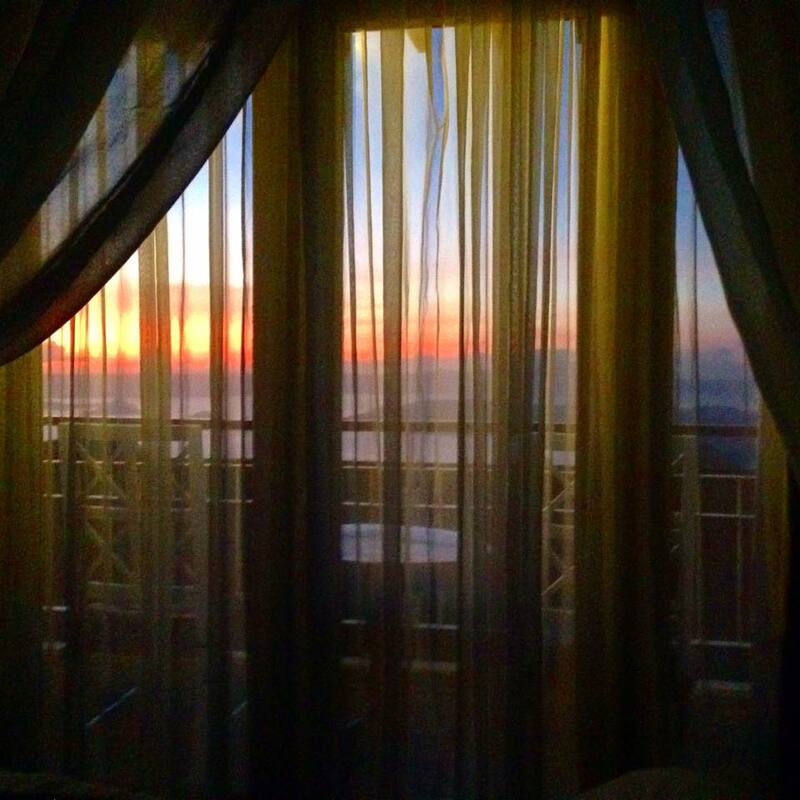 So for those days, I have witnessed the sunrise from the comforts of our room. The Greek Mister thinks that the room was small though but I think it’s alright. They have a hot and cold water in the shower which is very important specially in a cold place like Tagaytay but the water pressure was quite weak specially in the toilet. There’s always that scared feeling if it’ll go all the way down whenever you flush it. Lol. The breakfast they served us daily was also great! I was so excited to see all the traditional Filipino breakfasts on their menu which of course included fried rice, eggs and a viand of your choice. We call it “silogs” and I had all kinds of silogs during our stay there that I think I gained a few pounds when we left this place. You have to order your breakfast the night before and they will deliver it to your room at the time you advised them to. We’ve requested our breakfast to be delivered to us at 10:30am and they have never been late even for a second. 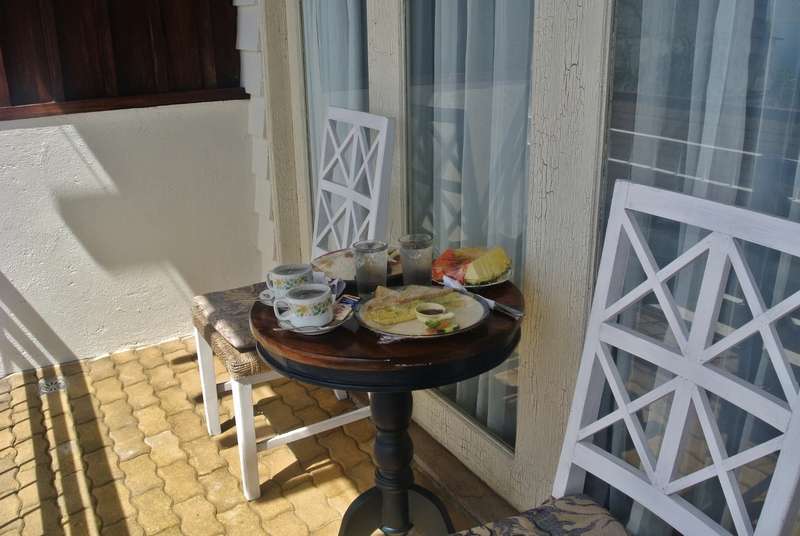 They’ll set it up in our veranda so we always had our breakfast al fresco style with a view. BReakfast! 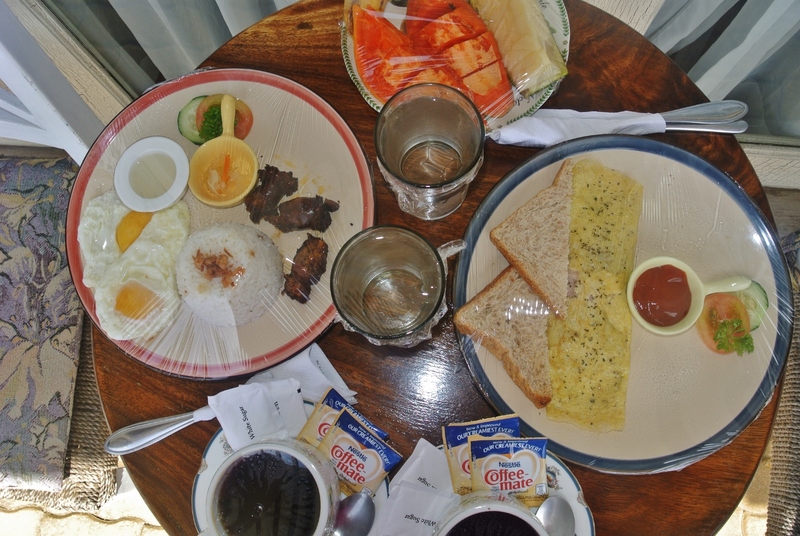 Longsilog for me and an omelet for the Greek mister. After all those good points of Joaquin’s Bed and Breakfast, what really impressed me was the impeccable customer service we’ve received the whole time we were there. I’m not sure if it’s because I came from a place where a good customer service is quite impossible to get or are the staff of Joaquin’s Bed and Breakfast really did deliver an outstanding customer service. Whatever it may be, it definitely surpassed my expectations. I’m hoping to go to Tagaytay next time we visit the Philippines and have bookmarked your review, this place looks fantastic and I love that view of Taal Lake. Hiking Taal Volcano was one of my favorite travel experiences growing up, hope to do that hike again! That view of Taal is just heavenly. Definitely get the room with the garden access. All of the rooms are facing Taal Lake and if you have a garden access then it’s better. We stayed for 4 nights and quite frankly, the garden rooms are quite beyond our budget if we are to stay for 4 nights. 🙂 Let me know how it is.